In August she started attending a big-girl gan with prayer and parshat hashavua and more doll strollers than she can count on both hands (I mean, if she could count. Now she counts like this: “One, two, eight, nine, ten!). Tsofia is thrilled to be in a big-girl gan (I mean, she is thrilled once she is done with her daily tearful “Eema, don’t go!” followed by my daily promise of any color popsicle she wants after pick-up–pineapple, tutti-fruity, apricot, or even cherry!). But despite her excitement, I’m sure that Tsofia often has no idea what’s going on in big-girl gan. And I see my Tsofia going through that same process with attempting to making sense of all the new things she’s learning in her big-girl gan…. 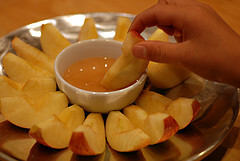 Before Rosh Hashana Tsofia came home and announced that she had learned from Ganenet Rachel (actually she calls her “Ganenet Achel…she can’t say the letter “R” yet) that soon we would be celebrating the holiday when we eat apples with honey! And then last week Tsofia returned home and announced with equal excitement that soon we would have a holiday called “Kippoo” which we celebrate by “only washing our fingers!” I understood that the Ganenet “Achel” had taught her that on Yom Kippur we are only allowed to wash our hands up to the knuckles. But then it occurred to me that Tsofia’s original thigh-sized view of the Jewish calendar isn’t so strange after all.